A variation on the classic game Capture the Flag, Pheon is a competition to obtain the game’s virtual talisman, the pheon, to restore balance to a virtual world called Terra Tectus. Players first determine their alliance to one of two groups: Staves or Knaves, and then complete various missions focused on the museum’s art collections, exhibitions, and programs to earn points and propel the game. Setting Pheon within a fictional universe isn’t all that remarkable. After all, it is an alternate reality game. Many other ARGs likewise place an emphasis upon alternate: I Love Bees involved futuristic AIs, Year Zero takes place in the year 2022, Superstruct (created by I Love Bees community lead Jane McGonigal) begins in 2019, and imagines humans have only 23 years left until extinction. The game will kick off with a “QR code” and web address being sent to educators and students around the country. The website will detail a dark and mysterious puzzle to be solved through the use of Civil War era communication technologies and authentic Civil War documents in the Museum’s archives. The game’s target looks to be middle school and high school students, and it sounds thoroughly engaging, what I’d call an authentic history game. Given the topic—the Civil War—I can’t help but make the connection to the way many other Americans have encountered the Civil War, through reenactment. I wonder—and I have only tentative answers to these questions—what are the differences between an ARG truly set in an alternate reality and an ARG that takes place in our reality, but in the past of that reality? In the case of The Jewel of the Valleys, what are the differences between a historically-driven alternate reality game about the Civil War and a reenactment of a Civil War battle? 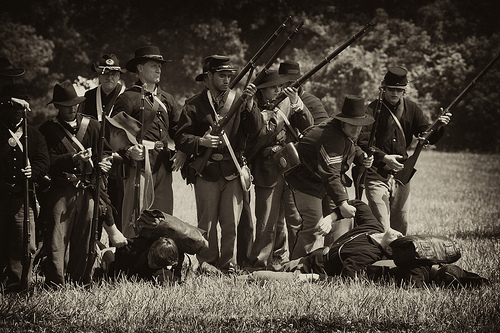 Is a Civil War ARG simply the gamification of reenactment? Or is there more to an ARG on an epistemological, narrative, and performative level? And finally, what can our questions about ARGs tell us about the relationship between games and our cultural heritage? And- thanks very much for the intelligent discussion of the place of historical ARGs. As my colleagues and I developed this game, we posed very similar questions- should the ARG play out the past as it happened? What place can fiction play in making the game more engaging, without misrepresenting actual events? At present, I’m sworn to secrecy about much of it, but expect a full debriefing to be published in early June.